Despite the argument made (PDF) by some small business advocates that intellectual property (IP) “is the backbone of America’s innovative small businesses,” small companies are less likely than large ones to believe that legal forms of intellectual property (IP) protection are important to their operations, a National Science Foundation (NSF) survey of U.S. companies reveals. For companies that undertake research and development (R&D) activities, a higher fraction of businesses with five hundred or more employees than businesses with fewer than five hundred workers rated all six forms of IP protection as “very important” or “somewhat important” to them. As the figure above shows, for most of the forms of IP protection, the differences between big and small businesses are not trivial. While 57.5 percent of large R&D-performing companies reported that utility patents are important to them, only 32.6 percent of small R&D-performing companies said so. 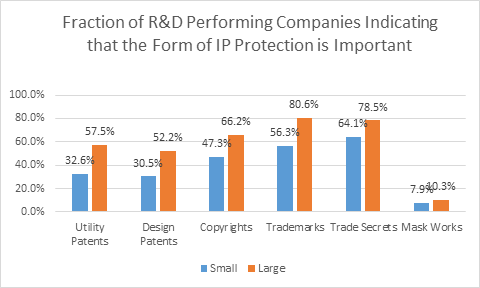 Similarly, 80.6 percent of large R&D-performing companies said that trademarks are important, while only 56.3 percent of small R&D-performing companies reported the value of that form of IP protection. For small companies, trade secrets were the most important form of intellectual property protection, identified by 64.1 percent of companies, followed by trademarks at 56.3 percent of companies, and copyrights at 47.3 percent. Both utility and design patents were less important than these other three forms of IP protection, coming in at 32.6 and 30.5 percent of small businesses, respectively. Mask works were important to the smallest fraction of small companies (7.9 percent), probably owing to their very specialized nature. Over time, intellectual property has become more useful to companies competing in high tech industries – the ones in which a high fraction of companies invest in R&D. This trend makes the pattern shown by the NSF data troubling. As IP becomes more important to the competitive strategies of businesses, its lesser importance to small companies makes one wonder if small business owners are missing out on an increasingly valuable source of competitive advantage. There’s another thing that small business’s have that can protect IP, and that is speed. 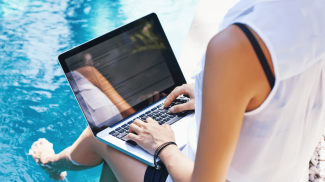 Whilst big businesses are consulting lawyers and having meetings, small businesses can be getting on with making products and selling them to people. 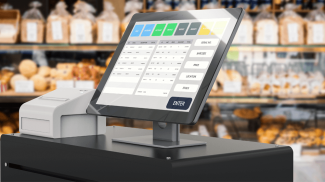 I have to believe that the cost and complexity make these things more difficult for small businesses, which is why large businesses feel they’re more important; it’s giving them the leg up on smaller competitors. I wouldn’t say that it is not important to them. It is just that they are not willing to spend the extra money on it. This is true especially for small businesses that are working on a really tight budget. Pingback: America’s SBDC | How Could 64% Of Businesses Neglect This One Valuable Asset? !